It can be hard to understand what you need to do when you are at the receiving end of a summons. So, let’s walk through the processes to understand how serving as a juror works. First it’s important to know that jury duty can get a bad rap because it is required, but in reality, jury duty can be fun. Have you ever watched a sleuthing movie where you tried to fit all the pieces together and solve the crime? How interesting could it be to watch the scene of a movie courtroom unfolding before your eyes in real life? Of course not all cases have that draw to pull you in and make you want to serve, but all jurors and juries are equally important. If we did not have people to serve on a jury to judge their peers who have been accused of crimes, who would see that those corrupt people were put behind bars or that those who are innocent aren’t found guilty? Jury duty is not only our civic duty, it is our responsibility as citizens to help make our country a more just place to live. What’s another positive of jury duty? You may get a paid day off, or possibly several days depending on the case. You get to legitimately miss work, and who doesn’t love that once in awhile? We all work to live, but we don’t want to live just to work. When a jury trial is set on the calendar, a random jury is selected from the Jury pool. The jury pool is composed of the jury questionnaires that are sent out to a random selection of people in August of each year. Jury duty is one of the privileges that comes with living in a democracy. However, even at the best of times, it can be an inconvenience to our own individual lives. Because of that, Lincoln County has structured their jury system to inconvenience prospective jurors as little as possible. They even offer hearing assistance receivers for those in need of additional hearing aids. Lincoln County District Court, located at 512 California Avenue, operates under the “One Day – One Trial” system. This means that once you have personally appeared for jury duty, whether or not you are selected to serve on the jury chosen for that trial, you will not be called again during the remainder of the jury term, the length of a year. All citizens 18 years of age or older, who have been residents for at least 30 days of the state and of the city, town, or county in which they are called for jury duty, and who are citizens of the United States, are eligible for jury service. Since Oct. 1, 2007, jurors have been selected from a combined list provided from the Montana Secretary of State of registered voters, licensed drivers, and holders of Montana ID cards. But wait, there’s more benefit than taking pride in performing your civic duty; you also get paid to act as a juror in court. 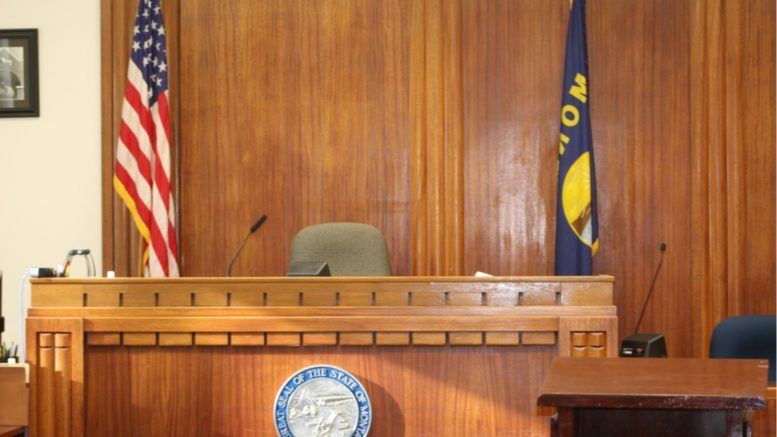 Lincoln County District Court jurors are paid $12 for appearing for jury selection, and the selected jury panel will be paid $25 per day while serving for the term of the trial. Jurors are also paid round trip mileage for traveling from their home to the Lincoln County courthouse located in Libby. As of Aug. 1, 2018, the mileage rate is $0.58 per mile. Potential jurors are sent a notification (Jury Questionnaire) in the mail, in April or May to prepare for the jurt term which starts on Aug. 1 The jury questionnaire requests prospective jurors to complete, sign and return the questionnaire in a reasonable amount of time. On the form, you are asked if you have a legitimate reason, more than mere inconvenience, that could keep you from serving as a juror. You can then request, due to the reasons you state, that you be excused from serving for jury duty. Reasons typically include prescheduled vacations, and medical or other health related issues. If you have requested to be excused from jury duty, and your request is granted, someone from the Clerk of Court’s office will notify you by letter or phone call. If you are not excused from serving at jury duty, you can request from the Clerk of Court’s office, a letter to provide to your employer showing that you served that particular day at jury duty. If you are denied your request to be excused from service, you still need to personally appear, lest you risk being found in contempt of court. Contempt of court can possibly result in a fine or imprisonment in the county jail for a term not to exceed six months, or both…. Imagine explaining that one to your boss at work. If you are selected for a specific trial, you will receive a jury summons by mail. The summons will notify you of the date, time, and estimated length of the trial. There are several phone numbers that jurors are provided to call for the status of their prospective trial. Once you receive the letter you will need to call one of the phone numbers listed to confirm receipt of the summons. You will then need to call the phone number provided by the court, a second time. On the last business day prior to the start of your scheduled jury trial date, you will need to call after 5 p.m. to confirm that the trial is still going forward. Save yourself a trip, especially if you are from out of town, and call the number. The Clerk of Court’s office will change the phone line immediately upon any change in the trial status. However, if the trial is cancelled last minute on the business day before the trial is scheduled to start, the Clerk’s staff has little to no time to call and notify all potential jurors of the cancellation. Staff will reach out to as many jurors as possible via phone calls and leave messages if needed. However, if you have a voicemail box that is not set up or you are out of service, you will not receive a notification. So please remember to call that juror line and check to see that your trial is still going forward as scheduled, before you show up at court for the date selected. Another important note to remember, at the top of your jury summons it will have an address for the court that you are summoned to. There are several different courts located in Libby. Please remember to check the address to ensure that you are showing up to the correct court. The Clerk of Court’s office is not responsible for cancelling or making sure jury trials go forward. While it can be frustrating to get a last-minute notification or cancellation, please remember that the staff at the Clerk’s office is performing their job as per the state laws, and they are only able to notify you of changes once the attorneys of record on the specific trial have reached an agreement of cancellation, continuance, etc. The judge will then make the decision to sign off on the continuance/cancellation, etc. The Clerk of Court’s office is then given the continuance/cancellation order and notifies potential jurors of the changes via the recorded phone line provided, and personal calls to jurors at the numbers that the jurors themselves listed on the jury questionnaires from earlier in the year. If you are appearing for jury duty, you will need to sign in at the Clerk of District Court’s office located on the top floor of the Courthouse. From there, staff will direct you. And then the fun begins.